Puritan Medical Products, a single-use US swab manufacturer specializing in the medical, diagnostic, environmental, and forensics industries celebrates 96 years of producing their extensive line of products at their Guilford, Maine facility. Our product line and workforce has grown substantially over the years which speaks to our global recognition as the most trusted, leading manufacturer of single-use medical products worldwide. Puritan Medical Products, a Maine manufacturer specializing in single-use swabs for the medical, diagnostic, environmental, and forensics industries celebrates 96 years of producing their entire line of products in the US. At a time when countless manufacturing companies are moving their operations outside the US, Puritan remains committed to designing and manufacturing their extensive line of products at their Guilford, Maine facility. Since 1919, Puritan has focused on the needs of their customers, including hospitals, labs, clinics, and OEM kit manufacturers. The family-owned and operated company believes that maintaining a superior level of quality and service is their best opportunity to serve the global community. Puritan products are essential to the important work of practitioners in patient care, to the technicians and scientists who conduct research to find better answers, and to the professionals who utilize their products. Keeping every facet of production in the US allows for a consistently reliable product, but offers an opportunity to support the local economy by hiring skilled American workers. While Puritan’s commitment to quality reflects in their record of excellent customer satisfaction, they attribute much of their success to a history of unwavering attention to detail which has transcended generations. The founder, from the heartland of the US, was an entrepreneur who passed his passion for quality to his children. That tradition continues today. Puritan’s commitment to provide state-of-the-art engineering, machinery design, and building of its own production equipment allows Puritan to control the manufacturing process and provide the high levels of quality control and assurance its customers have come to expect for nearly a century. As a nearly century-old company, Puritan continues to strengthen its standards of quality, consistency, and reliability with each passing year. Puritan employs a team of highly experienced individuals including leading microbiologists who strive to uphold Puritan’s commitment to innovation while embracing new technologies and focusing on the demands of customers. 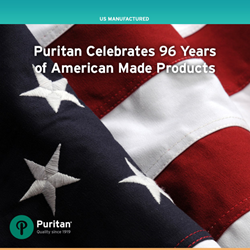 For more information about Puritan’s American-made commitment and their extensive line of products, visit http://www.puritanmedproducts.com/.